An ecosystem is a composite entity of biotic and nonbiotic parts. But it is not a simple aggregation of parts, where the properties of the whole are reducible to the properties of the parts (reductionism). Rather, the parts come together in a special synergy, producing emergent properties (holism). Reductionists maintain that parts of a whole are externally related: the essence of one part is completely separate and independent from the essence of another part; and the essence of the whole is exhaustively reducible to the essences of its constituent parts and the various relations among them. Holists maintain the contrary view, that the parts of a whole are internally related, so that the essence of each is partially constituted by the properties of all the others and of the whole. Hence, the whole cannot be understood from its parts and their relations to each other alone; and conversely, the parts cannot be fully understood apart from the whole. Considered holistically, an ecosystem will have emergent properties that are not properties of its constituent parts and cannot be reduced to or explained solely in terms of them. A synthesis of both approaches is needed. An alternative explanation for why we are unable to reduce some entities to their constituent parts and their properties is that we are simply ignorant of the details. As we learn more about them the reduction will become more and more complete. Holism is thus conceived as an epistemological deficiency and not as a metaphysical reality. But this is improbable with respect to highly complex systems that exhibit the unpredictable properties of an organic whole. Acknowledgement of this is critical for being able to see (know) and appreciate (value) nature as consisting of systems within systems. 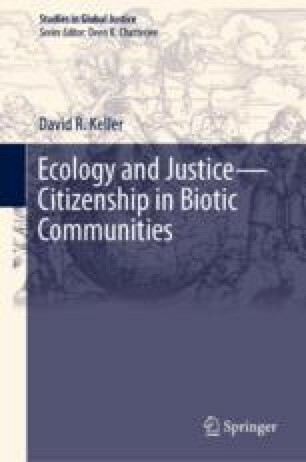 And this in turn is necessary for the attainment of ecological wisdom and ecological justice.